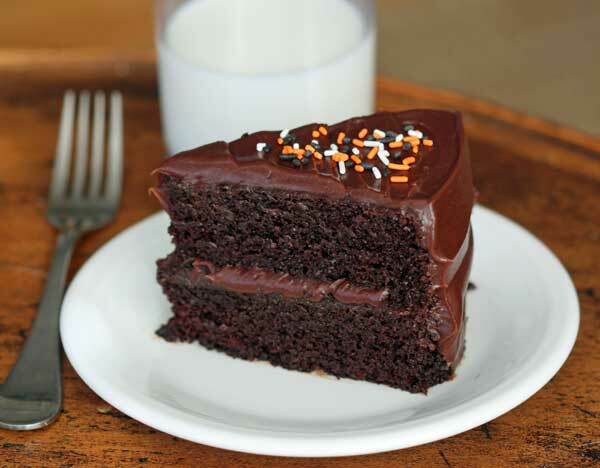 Halloween Chocolate Layer cake is a rich, easy, chocolate layer cake perfect for the holiday. This version is frosted with a chocolate sour cream frosting. Preheat oven to 300°F. Grease two 9x2 inch round pans and line bottoms with parchment. Grease again and dust with flour. Combine chocolate with hot coffee and stir until smooth. Let cool slightly while you prepare other ingredients. In a large mixing bowl, mix together sugar, flour, cocoa powder, baking soda, baking powder, and salt. In another mixing bowl, using an electric mixer, beat eggs for 2-3 minutes or until light and lemon-colored. With mixer going, very gradually add the oil, buttermilk and vanilla, then stir in the melted chocolate mixture. Add flour mixture to egg mixture and beat on low to medium speed until blended -- don't overbeat. Use a heavy duty scraper as you mix and be sure to scrape bottom of the bowl. Divide batter between pans and bake in middle of oven at 300 until a tester inserted in center comes out clean. For 9 inch pans, this should be about 50 minutes. Set the pans on a wire rack and let layers cool completely in the pan. Loosen edges with a knife and invert layers onto racks. Carefully remove parchment paper and let cool completely. To make the frosting, melt the butter and chocolate in a small saucepan over low heat, stirring constantly until smooth. Transfer melted chocolate to a large bowl and whisk in cocoa powder and vanilla, followed by 1 cup of the sugar and half the sour cream. Whisk in remaining 1 cup sugar, then gradually whisk in enough of remaining sour cream to form spreadable frosting (I used it all).